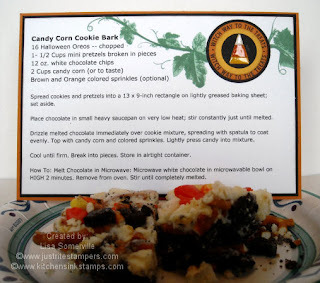 While searching the Internet last week, looking for snacks to make for the kids for after Homecoming, I stumbled across a recipe for Candy Corn Cookie Bark. I don't know about you, but I love Candy Corn, especially this time of year. I created a batch according to the directions...If I were to make it again, I'd do things a little differently. I think I'd melt the White Chocolate, mix in the chopped cookies & pretzels then spread in the greased pan, because the melted White Chocolate did not spread nicely onto the chopped cookies and pretzels, but the kids didn't care they ate it up in a heartbeat! I thought I'd make a cute little recipe card so I could tuck it in my recipe book. I typed the recipe in MS Word, then printed it onto a piece of White 4" x 6" piece of card stock, sponging the edges with Soft Suede. I stamped the Vine from Kitchen Sinks Multi Step Pumpkin as follows in the open space: #1 Cottage Ivy stamped off, #2 Cottage Ivy, #3 Cottage Ivy, #4 Cottage Ivy. 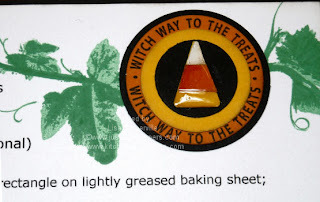 The sentiment is from the Limited Edition Set Witch Way to the Treats from JustRite (which has been sold out) stamped in Black using the 1-3/16" Wooden Stamper on Pumpkin card stock, the punched with a 1-1/4" Circle Punch. To create the Candy Corn, I punched a Large Star from Pumpkin, White and Summer Sun card stocks, cutting one point of the star to use as my Candy Corn. I lightly sponged the edges of all pieces with Soft Suede, then cut my stripes to begin assembling the Candy Corn. After layering my finished piece onto a 1/2" Black Circle, I applied Glossy Accents, and let dry. This piece is layered on a 1" Summer Sun Circle, then onto the Pumpkin Circle and a 1-3/8" Black Circle, then adhered to my recipe card as shown. How cute, clever and Yummy! My mouth is watering...this looks yummy! You're a good Mom! Cute recipe card.